Drawing from the cache of video projects and documentation that Half Straddle has been creating since the company’s inception in 2008, this new presentation juxtaposes previously unscreened excerpts from the Half Straddle video archive in an installation format. “Cadences” functions as both documentation and a deliberate poetics of particular performers and performances as the people and work have moved—and move—through time. The piece becomes a record, then loop, of experiments, physical changes, and an ongoing interrogation of a kind of community creating together. COME HANG! DONATE TO JOIN US! With a donation of $25 or more, join us for a post-show Champagne Hang with complimentary drinks at New York Live Arts after the show on FRIDAY, APRIL 22 or FRIDAY, APRIL 29! AND, receive a limited edition Half Straddle tote! Get your tickets for our new show Ghost Rings and use the artist code: "artistfriend" to get cheaper tix! Tina and Jess are leading a new generative workshop for writing and performance. Find out more about it and apply HERE! Check out the new music video that we made for Moon Duo's song "Free The Skull"! We're honored and excited to announce that Tina Satter has been named one of 14 artists to receive a Foundation for Contemporary Arts Award. The panel of judges and other recipients are inspirational and it's a privilege to be included in such a distinguished cohort. Check out more information about FCA and the grant HERE. 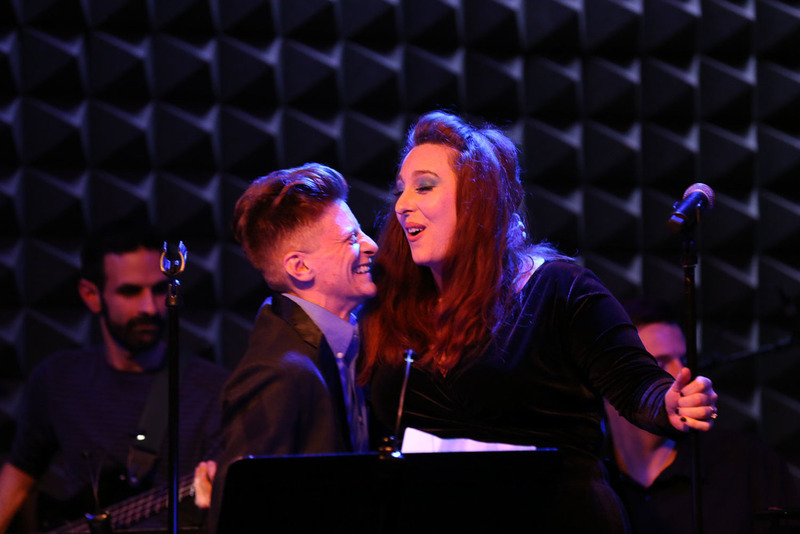 Our benefit concert at Joe's Pub in October turned out to be one of our favorite company events ever. Kimberly Clark (Chris Giarmo's fabulous alter ego) led a live band and the Half Straddle company singing original songs from 8 years of Half Straddle shows. We were joined by very special guests and friends including Heather Christian, Jim Fletcher, Hannah Heller, Mike Iveson, Jo Lampert, Paul Pontrelli, Lucia Roderique, James Sprang, and Lucy Taylor. Here are some of our favorite photos from the night!